There are over 20 sleights explained in full as well as videos of Paul performing twelve of these sleights, in what situations they are used, and how they are performed, including the many subtleties involved to make each sleight "invisible" to spectators and to many magicians. Learn an almost completely unknown secret of Vernon's, to make your Classic and Jiggle Passes super fast - and it is easy. Wait until you see this. For a special treat, Paul has included 12 terrific effects using many of the sleights explained within this ebook - and - another bonus effect provided at the bottom of Mike Powers, "MOVES" section! As ANOTHER BONUS Paul has included a section for each sleight, called, "Points to consider" which explain many of the nuances of each sleight, ideas for performance and what to expect from your spectators. 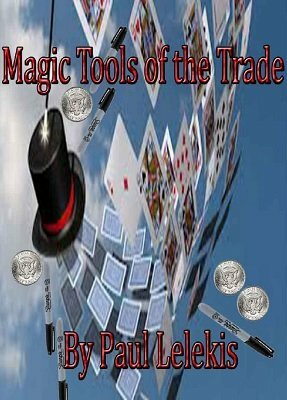 In addition, Mike Powers has granted Paul's readers, access to his "MOVES" section inside Mike's website, The Mall of Magic! You will be provided with the website and password to watch many other videos of sleights on Mr. Powers' newly upgraded website - in high resolution Vimeo. Learn the "secrets" of six Passes, six Multiple Shifts, and many Switches, including a video and full explanation of the elusive, underground sleight, Dingle's No-Lap Switch. You will fry your fellow magicians with this one. Learn Additions, Subtractions, Transfers and many other lesser known, but very important sleights. This is not an ebook of Elmsley Counts and double turnovers - but a book of world class sleights. Every nuance is covered in full, detailed by videos and the uses, the psychology, the specific methods of performances, and the situations that you will encounter - all explained in detail. This ebook is not for beginners - but more for the intermediate to advanced performers. Remember - sleight of hands with cards is an ART! 1st edition 2014, 36 pages.